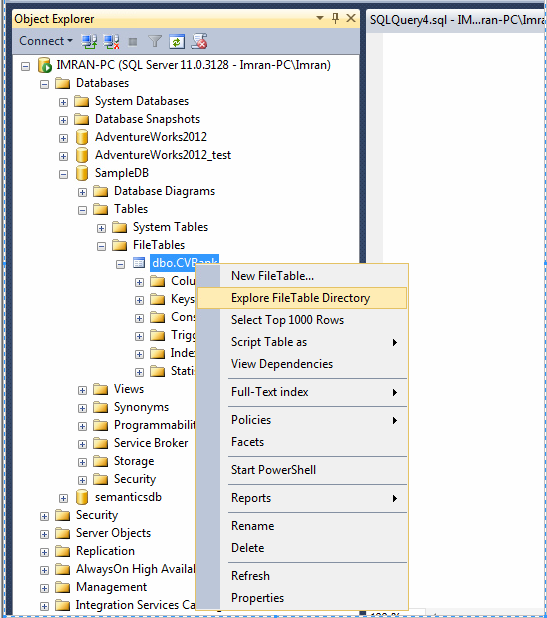 Filetable is one of the best features shipped with SQL Server 2012. It makes our life easier when you need to manage your files and folders via SQL Server when it actually resides in the file system of windows. 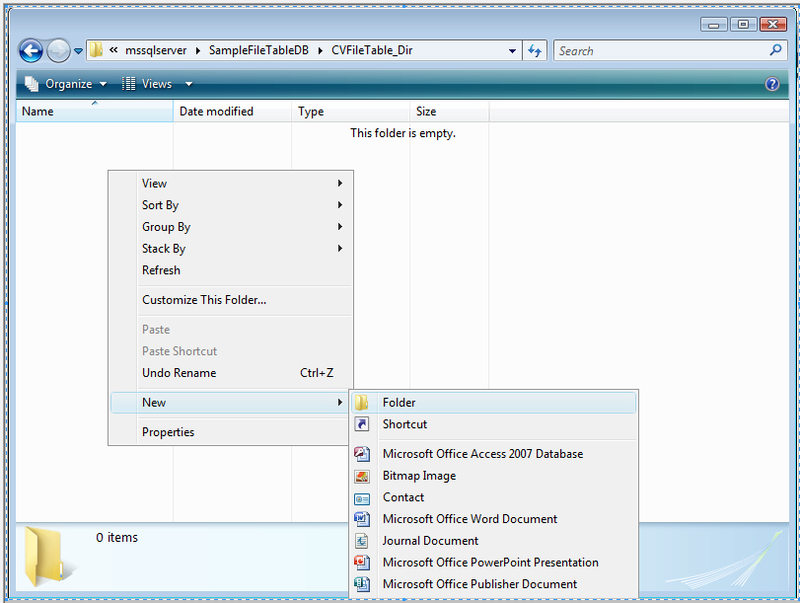 However, you can easily access them using windows application and SQL Server as well. 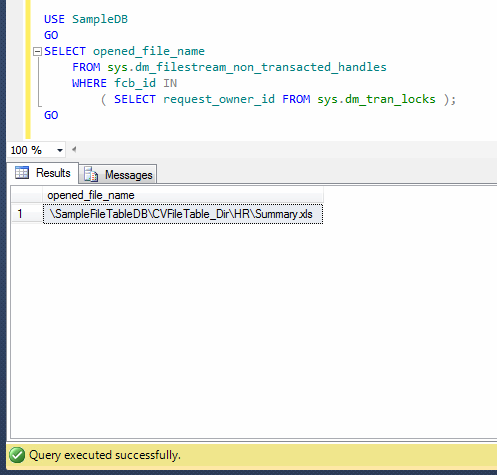 Sometimes, you execute a select statement against a filetable using SQL Server Management Studio (SSMS) and it becomes inaccessible and even after spending so much time, the query does not return the result set. However, you can still access it via windows file system. In normal scenario, filetable returns result set in less than few seconds (depending upon the size of filetable). Now what to do ? First of all, I cancelled the query that kept on running for hours. It seemed to me that this filetable had been locked because of some transaction. Just to test this scenario, I executed the same query with no lock table hint and it returned the result set as shown below. 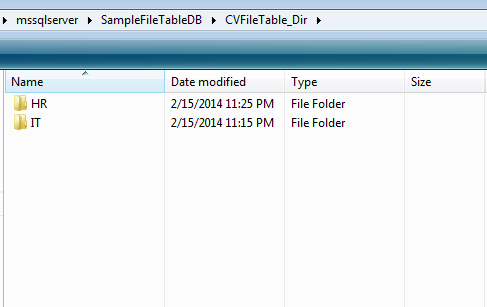 Wow, so the file table was indeed locked. So half of the problem is solved. Now, in order to fix this issue, I need to identify which file(s) is/are being used and due to which, the filetable has been apparently locked. 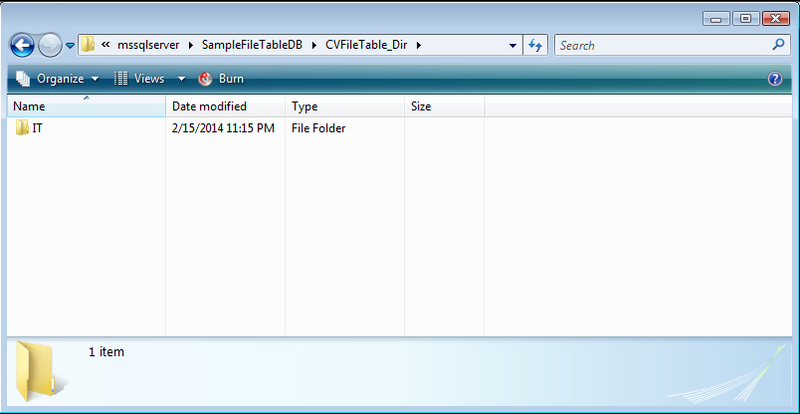 Given below is the script that will give you the file(s) name being used and due to which, the filetable has been locked. I found this script on MSDN. As mentioned above, I identified the lock held by the filetables and in order to avoid this issue, you can take necessary action to close this file. Let me know if you come across this situation in real world. In my earlier article, I wrote about how to generate a serial number by using the sequence object for a result set . However, sometimes you need to generate a negative serial number for any result set and you can easily achieve it by adjusting few properties in the sequence object. Let me explain it step by step to demonstrate the solution. First of all, you need to create a sequence object along with some specific negative parameters as shown below. 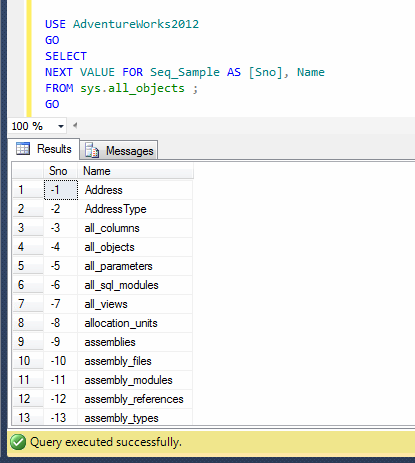 In this step, you are ready to use the above sequence object to generate a negative serial number as shown below. In this step, you need to reset the sequence number in order to start the sequence number from -1 each time. Given below is the script. Let me know if you came across this situation and how you fixed it. Sequence object is one of the handy objects when we need to maintain one serial number across the tables. I have written few articles on Sequence object earlier in my post. Today, I will share an issue that I came across while dropping sequence object. 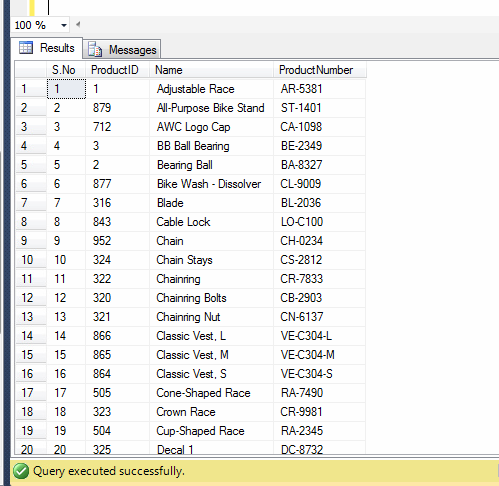 I created few tables and made a single sequence object as a default serial number in one of the columns in these tables. But once I drop this sequence object it gave me error due to dependency. It seems that I need to go one by one and search each dependency of this sequence object and drop all of them before dropping Sequence Object. Let me create an example to demonstrate the solution. 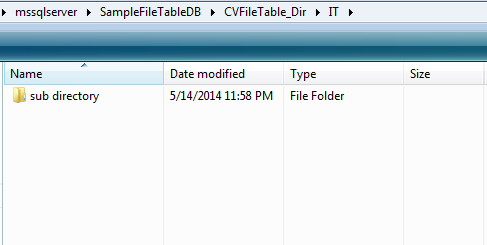 -- This script is compatibile with SQL Server 2012 and above. 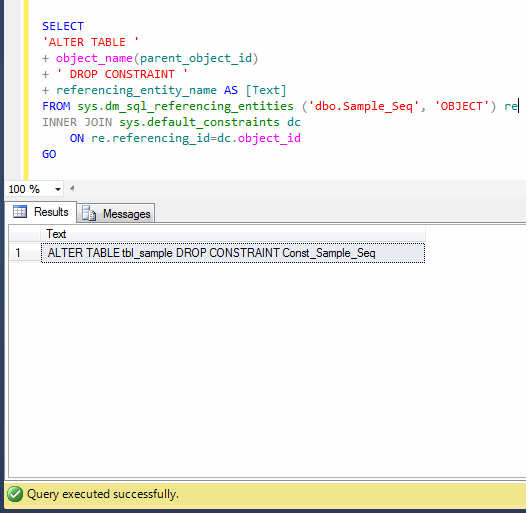 Cannot DROP SEQUENCE ‘Sample_Seq’ because it is being referenced by object ‘Const_Sample_Seq’. As mentioned above, I created a default constraint to a table using sequence object. The problem started when I tried to drop the sequence. Due to dependency, if one sequence object has been used in multiple tables as a default value, then you need to search each dependency of that sequence object and as usual drop all dependent objects before dropping the sequence object. You can do it, one finding and dropping one object by one object, simple but hectic solution. Alternative, you can use give below solution. This solution will prepare script to drop all dependent objects of the any sequence object. Just copy the above result set and execute it as mentioned below and it will drop all your dependent objects related to sequence object. Given below is the script. Once you drop the constraint, you can easily drop the sequence, you will not get the above error. Let me know if you came across such issues and its solutions. Generating Serial number is something that is very usual for a SQL Server developer, either it is for report or any result set. I would not be wrong if I said that it is something that we need to use every now and then. I usually use ROW_NUMBER to generate the serial number in most of the places unless otherwise any compatibility issues. However, I wanted to generate it in new ways and recently, I found a new method to generate serial number while playing with Sequence Object. Given below are scripts to generate a serial number using ROW_NUMBER & SEQUENCE Object. --in the next result set. I deployed some Sequence objects on production database and after couple of days, I was facing some problem with Sequence objects. 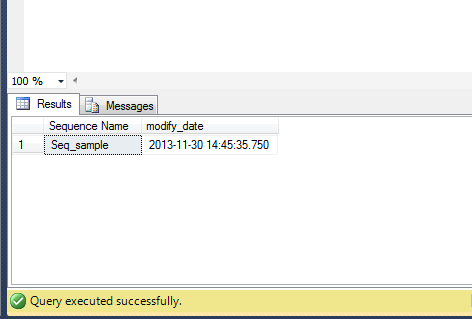 It was little difficult to debug all sequence objects at once, so I thought of checking the sequence objects modified dates to find if I modified any Sequence object after deployment. Given below are the two methods to find the modified dates of Sequence Object.